Ensure the webcasting company and the client work closely to assess all relevant webcasting needs, and clearly define expectations. Find out what they know (or don’t) about what is required on both ends. If the presenter showing slides, do they have a laptop, projector and screen? I have run into more than a few clients who hadn’t been asked to given this any consideration. See if your webcast provider is willing to do a test, prior to the actual event. This provides the opportunity to find out if there are any technical issues to overcome, involving things like internet connectivity at the venue, bandwidth, firewalls, etc. The more technical problems discovered (and solved) beforehand, the smoother the live streaming event will be for the onsite team and your viewers. 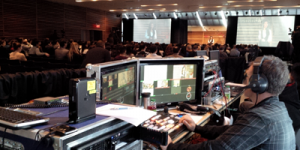 A good webcasting provider will work with the client to discuss the content of the show, ensuring a smooth program delivery throughout the course of the webcast. Presentation slides, videos, images and text to be shown during the webcast should be vetted beforehand, to ensure they all play smoothly and in a timely fashion. Presenters should be scheduled and addressed; are they all speaking from a lectern, or do they need wireless lav microphones? Are they standing still, or is a second camera required, to capture them moving and interacting with others on stage, such as a panel? Planning this content ahead of time makes for a compelling show to deliver. Ensure smooth delivery of the show by having a plan to deliver the content. This can be done with a simple agenda, but more importantly, having a ‘Plan B’ ready in case any last minute changes to the agenda occur. A good webcast provider is more than just a technical resource serving your content to the web, no matter what it looks like. What if one of the presenters is late, causing a change in the speaking order, and presentations to display? The streaming provider should demonstrate ability to adapt ‘on the fly’, by directing the technical delivery of the show in a timely fashion to smoothly capture the changes on stage. And don’t forget ‘Plan C’: Redundancy. What is the live streaming provider doing to ensure the event is recorded, in the event of technical difficulties associated with the live broadcast? If something goes wrong with the internet connection during the show, it may not be in any way the fault of the webcast provider. That said, have a discussion to address recording the show, so you can post it later when the internet is fixed. In the event of this kind of technical difficulty, a late delivery is still better than no delivery at all. For a good article on delivery tactics once the webcast is live, check out Mike Volpe’s 10 Best Practices for Webinars or Webcasts. The show’s not over ‘til it’s over. That sounds simple enough, but it’s worth a discussion between the webcasting provider and the client, before the webcast takes place. Will there be a need for an archive of the webcast? Does the client wish to have a recording of the event? Is the recording to be of the main compilation (called the Program Feed or Switched Feed) the only requirement, or is footage also required from each camera used (called an ISO Record), to make a new compilation or demo reel after the event? These topics need to be addressed before the live webcast, to ensure the post-production needs are met. Again, the key here is finding a solution where the webcast provider and the client are communicating clearly to assess needs and expectations, before the show goes live. Having the discussion up front and ahead of time will go a long way toward ensuring a successful and engaging webcast. Dr. David Weiss, President & CEO Weiss International Ltd.
See examples of our webcasting, webinars, video streaming, conference recording and video conferencing work.